Save when purchasing multiple coaching manuals, novels or DVDs. Specials are offered from time to time and listed here too! Bundle of Netskills Coaching Manuals 1, 3 & 4. Also included Season Series for 13-16 Year Olds. Purchase these 4 Manuals together and receive a 15% discount. Contains Coaching Manual 1, 3, 4 – The Complete Series and Season Series for 13-16 Year Olds. Bundle of all Netskills Coaching Manuals 1,2,3 & 4. Purchase these 4 Manuals together and receive a 15% discount. 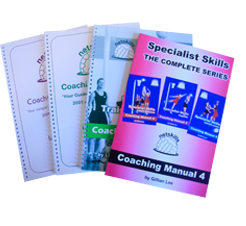 Contains Coaching Manual 1, 2, 3 and Coaching Manual 4 – The Complete Series. Package of all four DVD titles. Contains all four Netskills DVD titles – Attacking, Defending, Ball Handling & Training Games. Netskills DVDs are the ideal tool for coaches who want to get the full potential from their players. They say variety is the spice of life and that’s equally true for training activities. Netskills DVDs have a huge range of activities that enable you to keep every training session filled with new ideas, keeping players excited and interested. 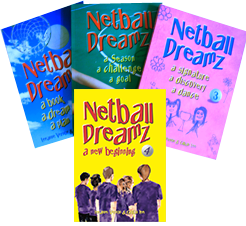 These DVDs are a comprehensive educational aid for anyone who loves their netball. BIG Discount off RRP of purchasing each DVD separately. “Awesome book; great story with exciting new skills. I wish I had it when I was young. Fantastic!” ~ Bianca Chatfield – Former Australian Netball Diamonds Player. “Wow! What a great fun story. It also has heaps of tips for helping make you a complete netballer, who’s positive and in peak condition.” ~ Sharelle McMahon – Former Australian Netball Diamonds Captain.